The Dark Knight's greatest enemy may not be the central antagonist of the next Batman video game but that doesn't mean you can't hear Mark Hamill do his rendition of the Joker anymore. This Clown Prince of Crime? He literally poops on Batman. Thanks, Robot Chicken! 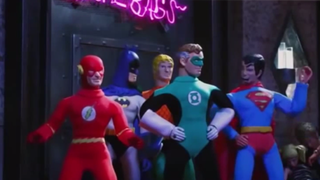 The return of Hamill as the Joker is only the tip of the naughty iceberg in this interactive trailer for the upcoming Robot Chicken DC Comics Special 2: Villains In Paradise. Click on the right options and you'll see a Shawshank Redemption skit with Black Manta in the Morgan Freeman role or the Justice League trying to be pick-up artists in a bar. All of the various paths that I've watched are hilarious but the Stan Lee skit shows a horny side to the Marvel Comics legend that you probably never knew he had. The special airs this weekend. Excelsior!